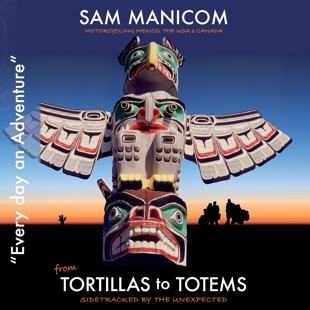 Sam Manicom’s dramatic fourth audio book takes you on an enticing yet frequently challenging motorcycle journey across the ever-changing landscapes of Mexico, the United States and Canada. Sam’s partner Birgit is no longer a novice motorcyclist – riding through southern Africa and South America turned her into a rider capable of facing any challenge. But Sam was worried. Samuel Johnson wrote, ‘The use of travelling is to regulate imagination by reality, and instead of thinking how things may be, to see them how they are.’ After all, aren’t these some of the main reasons for going travelling? To experience as many different things and ways of life as possible? To discover new and wonderful things, but also to have preconceived ideas challenged. This true life story has more twists and turns than a Rocky Mountain Pass, and as it did them, at times it could challenge you too. Woven into this surprising story are canyons, cowboys, idyllic beaches, bears, mountains, Californian Vineyards, gun-toting policemen with grudges, glaciers, exploding volcanoes, dodgy border crossings and some of the most stunning open roads that a traveller could ever wish to see. The Tortillas To Totems audio book is recorded by Kite Studios, distributed by Open Book Audio and is available to buy via Audible, iTunes and other retailers.